Baked Oatmeal’s fans are tweeting like crazy with phrases like “too good to be true,” and “party in my mouth” being thrown around. This makeover won’t soon be forgotten. 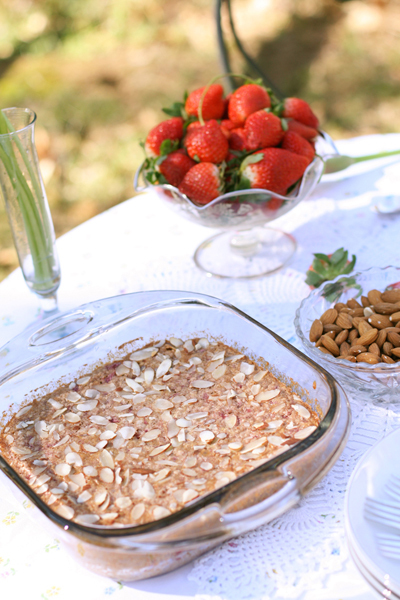 Humble baked oatmeal is barely recognizable with the addition of delicate almonds and fresh strawberry puree. Splash on some heavy cream and the usual weekday breakfast fodder is now dressed up for a decadent weekend brunch. Hi I’m Melodie: traditional foods nerd, nutrition enthusiast, and recipe developer, to name a few of my food-related rolls. I grew up in West Africa as the child of missionaries (a wonderful experience!) and from an early age enjoyed cooking and baking. Only in Africa, grocery shopping looks a lot different than it does here. Locally grown food is sold in open-air markets, and imported goods like butter and cheese are only found in the big cities at expensive supermarkets. So I learned to work with local ingredients and the rare imported food item purchased on special trips to the big city. (One village we lived in was 8 hours away from the closest supermarket!). Thus I became adept at recipe makeovers. Which is why when the first strawberries of this season started to appear in the grocery store I knew I wanted to dress up baked oatmeal with this beautiful fruit. You see, I’m crazy about baked oatmeal. I’ve determined it’s the healthy, frugal eater’s breakfast of choice. Ah…you must be new to the traditional foods scene. Boxed breakfast cereal is a modern food. Traditionally eggs, bacon, soaked porridge, fruit, cultured dairy, and sourdough bread were regular breakfast fare. Breakfasts were not so carb focused and more nutrient dense. It really is ironic how popular breakfast cereal is, as just about every kind on the market is loaded with sugar and made of highly processed grains. Most are the equivalent of eating a couple of cookies, yet young and old alike regularly choose this food for breakfast. The grains, even those labeled as “whole grains” are processed at very high heat and most undergo a process called extrusion which renders the proteins toxic, according to some studies. Even granolas contain tons of sugar and are baked at very high heat. How sad that boxed breakfast cereal is now the cultural breakfast of choice, especially for little children who need to make the most of every calorie consumed. But if you’re going to replace easy and tasty cereal with something healthy, it has to taste good. Especially when children are involved. Enter baked oatmeal. 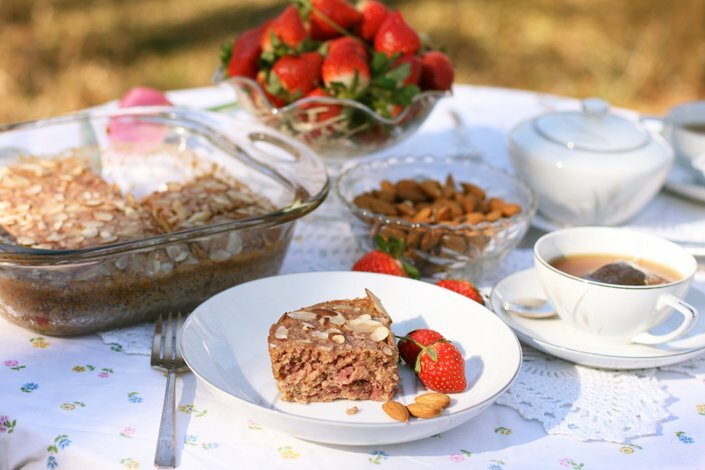 It’s cheap, tasty, can be served with milk and dried fruit like regular breakfast cereal, there are many flavor variations, it can be made in advance to be eaten the following morning, and it appeals to both children and adults. Plus, by soaking the oats through the night the traditional method of porridge preparation is mimicked and the oats are made more digestible and nutritious. If you’ve been to my blog you know that baked oatmeal is one of my favorite healthy breakfast foods. 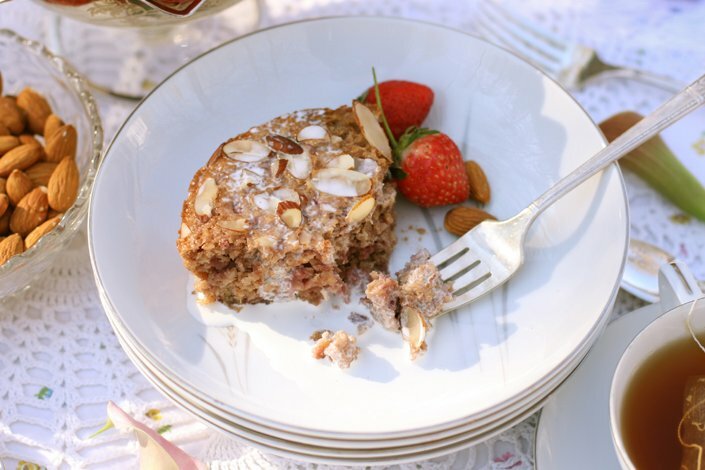 I’ve got several baked oatmeal recipes on my blog that have been very popular! I even started a baked oatmeal blog just for this one breakfast food! Despite the many recipes I already have, I just can’t resist experimenting with new flavors! Last summer I was all about the blueberries and bananas. In the fall I perfected a Cranberry Orange recipe. 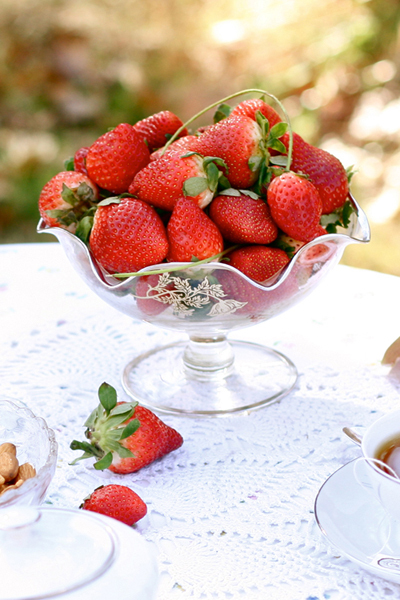 This spring, it’s all about the strawberries! Who knows what this summer will bring :-)? For those who aren’t familiar with the concept, soaking grains in an acidic medium for 12-24 hours helps predigest the grain and break down nutrient blockers making the nutrients far more digestible by the human body. Grains (which are seeds) contain phytates (nutrient blockers) and other substances designed to keep the grain from deteriorating until the optimum conditions are obtained for germination. This is a good thing for the seed, but a bad thing for the human digestive tract. Unless a grain is properly prepared it cannot be digested well. Soaking dissolves the phytates and makes the vitamins and minerals found in the grain (those being protected so fiercely for germination) bioavailable to our bodies. I recently learned from this informative post that oats do not contain a lot of phytase (used to help break down phytate). So with this baked oatmeal recipe, I’ve added a small amount of whole wheat flour, or buckwheat flour for a gluten-free option, to increase the phytase. Plain Greek yogurt can be used in place of the regular yogurt, just decrease the yogurt to 1/4 cup and increase the water to 1/2 cup. For a gluten-free recipe, use gluten-free oats and buckwheat flour. You could also try omitting the whole wheat flour. The recipe should still turn out great, though the phytate won’t break down as much. The strawberry sauce can be made in advance to save time before you make the recipe. Due to the extra moisture from the strawberry sauce, I don’t recommend trying to substitute a liquid sweetener for the granulated options I’ve listed below. 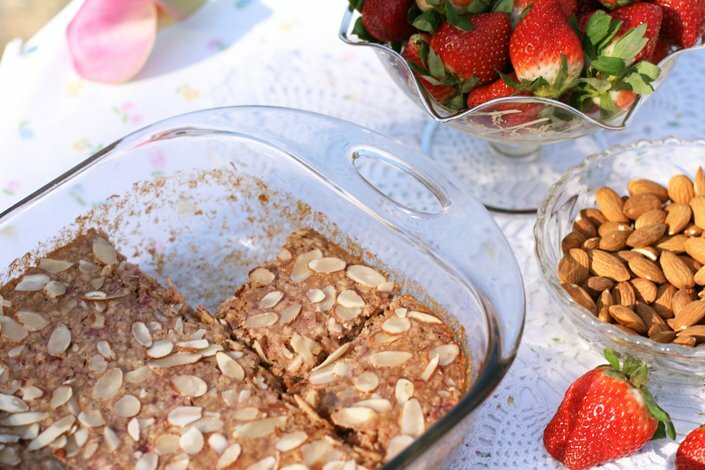 This strawberry almond baked oatmeal is a budget friendly breakfast that’s easy and filling. In a bowl combine strawberries and 2 tablespoons sucanat. Set aside for at least 10 minutes or place in the fridge overnight. Coarsely mash the berries (I used a potato masher). They should measure about 1 1/3 cup. Pour into a small saucepan. Turn heat to medium and cook and stir until most of the liquid has visibly evaporated and the berries are the consistency of warm jam. This should take about 15 minutes. The mixture should now measure about 2/3 cups. In a medium bowl combine the yogurt, water, and whole wheat or buckwheat flour. Stir in the oats. The mixture will be very dry. Cover the bowl with an air-tight lid or plastic wrap and set in a warm place for 12-24 hours. After the oaks have soaked, preheat the oven to 350 degrees. Combine the coconut oil or butter and remaining 6 tablespoons sucanat in a small bowl. Whip in the egg, almond extract, baking soda, and salt. Pour this mixture over the oats and combine with an electric mixer until smooth. (You need an electric mixer because the oat mixture is quite dry). Stir in the strawberry sauce by hand, just until combined. Using a little butter or coconut oil, grease an 8×8″ or 9×9″ baking pan. Poor the batter into the pan. Sprinkle the sliced almonds over the top. Bake at 350 degrees for about 25 minutes or until the edges are light brown and start to pull away from the pan. Serve with a few tablespoons heavy cream drizzled over each slice. What’s your favorite way to prepare oatmeal for breakfast? Melodie Kejr from Sweet Basil 'n Spice currently lives in South Carolina with her husband Kevin and one-year-old boy. Faith, family, missions, photography, food preparation, and studying nutrition are her biggest passions. Melodie has a unique perspective on life due to her upbringing in West Africa and years as a missionary in Liberia. She grew up without the fast paced life of her peers and enjoyed raising animals, sewing, riding bikes, hiking in the rain forest, and trying to make American tasting foods with limited local ingredients. When she is not getting her one-year-old out of trouble, Melodie spends most of her time experimenting in the kitchen. She loves taking real food concepts to recreate meals that appeal to the average American tastes as well as coming up with the most frugal way to eat a traditional foods diet. This looks delicious! Thanks for the recipe Melodie. Do you think this recipe would also work with steel cut oats? @NicoleLCrawford Thanks Nicole! No, this recipe would not work with steel cut oats :-(. I’ve tried baked oatmeal with steel cut oats and I will need to experiment a lot more as so far it has not turned out. @MelodieK Thank you! I had a feeling as I’ve tried baked oatmeal once with steel cut oats and it was tricky. It turned out but I had to bake it for a loooooong time! And the oats were a little crunchy. Anyways, thanks for the response and I look forward to trying the recipe! HalleCottis Looks great. 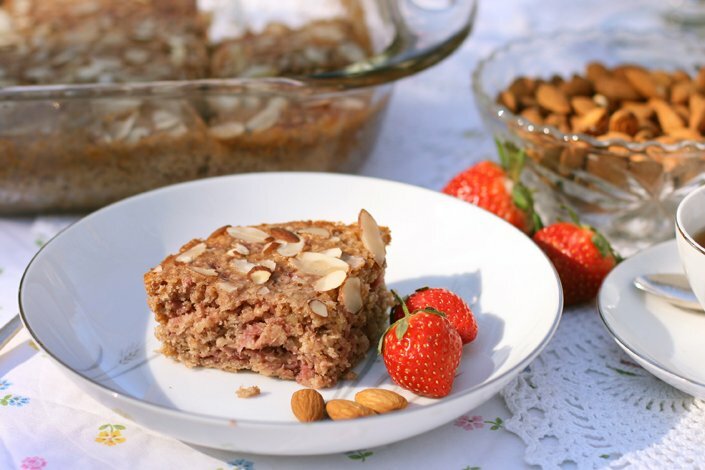 We have a fave Baked Oat recipes as well. I miss it. Great post AND recipe, Melodie!!! What a wealth of information! Thanks! Great information on soaking the oatmeal Melodie, and it looks wonderful ! How do you recommend storing leftovers? Oh my gosh!!!! I just took a risk and made this to take to a surprise birthday brunch for my best friend’s mother-in-law!!! It is AMAZING and was a HUGE hit!!!! I’m hooked!!!! The only difference for me is that it took much longer to cook (45 minutes). I made a double batch and it practically vanished even though there were many other delicious items to eat! Can’t wait to make it again and to experiment!